Mold Remediation Experts offering a wide variety of removal options. 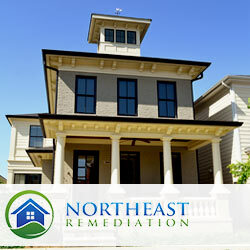 Northeast Remediation has a large amount of experience in dealing with mold remediation in homes. While mold is not as regulated as lead and there is no required license necessary to perform the work, it is always best to hire an individual who is knowledgeable and understands the dangers of mold. If remediated incorrectly and without the proper equipment, additional spores can be released into the air, actually worsening the situation. Exposure to mold can be extremely dangerous, depending on the type of mold found. Not only can it be detrimental to your health, but should mold continue to colonize and grow, the surrounding areas in the home can become completely destroyed. Early detection is critical in preventing a small mold problem from becoming a large one. There are a number of treatments available when dealing with mold remediation. Depending on the location of the mold and the size of the area affected, the methodology chosen can vary.